Last week in our series, we talked about the election of eighteen twenty-eight. Andrew Jackson defeated President John Quincy Adams, after a campaign in which both sides made bitter and vicious charges. One of those charges was about Jackson's wife, Rachel. His opponents accused him of taking her from another man. They said Andrew and Rachel were married before she was legally divorced from her first husband. This was true. But it was because her first husband said he had divorced her, when really he had not. Andrew and Rachel remarried -- legally this time -- after they learned of the situation. 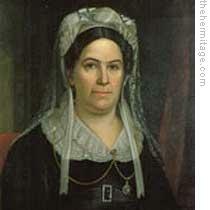 Rachel Jackson was a kind and simple woman. The campaign charges hurt her deeply. She was proud that Andrew was elected president. But she was not happy about the life she would have to lead as first lady. At first, it was thought that she might remain in Tennessee. But Rachel Jackson knew that her place was with her husband. She would go with him to Washington. But then, tragedy intervened. Our story this week is told by Jack Weitzel and Stewart Spencer. Preparations had to be made for the move to Washington. And for weeks, the Jackson home was busy. There was little time for Misses Jackson to rest. Her health seemed to suffer. Then on December seventeenth, just a few days before the Jacksons were to leave for Washington, two doctors were rushed to the Jackson home outside Nashville. They found Rachel in great pain. She seemed to be suffering a heart attack. The doctors treated her, and for a time, she seemed to get better. After a day or so, Rachel was able to sit up and talk with friends. She seemed cheerful. Jackson was at her side much of the time. On Sunday, Rachel sat up too long and began feeling worse. But the doctors said it was not serious, and they urged General Jackson to get some rest. He was to go to Nashville the next day. After her husband went to sleep in the next room, Rachel had her servant help her to sit up again. Rachel's mind was troubled about the years ahead in Washington. "I had rather be a door-keeper in the house of God," she said, "than live in that palace in Washington." A few minutes after ten that night, Rachel cried out and fell from her chair. The servants' screams awakened everyone. Jackson was the first to get to Rachel. He lifted her to the bed. He watched as the doctors bent over her. Jackson read in their eyes that life had left Rachel. Jackson could not believe it. He sat next to her, his head in his hands, his fingers through his gray hair. To his friend, John Coffee, Jackson said: "John, can you realize she is dead. I certainly cannot." Rachel was buried two days later. Ten-thousand persons went to the Jackson home for the funeral. The Reverend William Hume spoke simply of Rachel Jackson's life. He talked of her kindness and humility. And he told how she had been hurt by the terrible charges made during the election campaign. Jackson fought to hold back his tears. When the churchman finished speaking, those near Jackson heard him say: "In the presence of this dear saint, I can and do forgive all my enemies. But those vile wretches who have lied about her, must look to God for mercy." Jackson felt that Rachel's death was caused by the vicious charges made during the election campaign. He told a friend a few days later: "May God almighty forgive her murderers as I know she would forgive them. I never can." 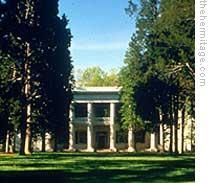 Jackson left his home January eighteenth to begin the long trip to Washington. "My Heart is nearly broken," he said. "I try to lift my spirits, but cannot." In Washington, no one knew what to expect. Senator Daniel Webster wrote a friend at Boston: "General Jackson will be here about the fifteenth of February. Nobody knows what he will do when he does come. My opinion is that when he comes, he will bring a breeze with him. Which way it will blow, I cannot tell. My fear is stronger than my hope." Crowds of Jackson's supporters began arriving in the capital. Some wanted to see their man sworn-in as president. Many wanted -- and expected -- a government job. 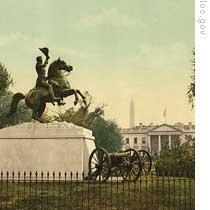 General Jackson arrived in Alexandria, Virginia, across the Potomac River from Washington, on February twelfth. Jackson was sixty-one years old. He was a tall, thin man. His face was wrinkled. And his white hair was pushed back from his high forehead. His eyes -- usually sharp and commanding -- were filled with grief. Jackson's health had never been really good. He carried in his body two bullets from duels fought years before. But he was a tough man with a spirit strong enough to keep moving, even when seriously sick. For three weeks, the general met with his advisers and friends. He decided on the men who would form his cabinet. For the job of Secretary of State, Jackson chose Martin Van Buren of New York, a man of great political ability. He named a Pennsylvania businessman, Samuel Ingham, to be secretary of the treasury. John Berrien of Georgia was chosen to be attorney general. His Navy Secretary would be John Branch, a former senator and governor of North Carolina. For war secretary, Jackson chose an old friend, Senator John Eaton of Tennessee. Three members of this cabinet -- Berrien, Branch, and Ingham -- were friends of John C. Calhoun, Jackson's vice president. Calhoun expected to be president himself when Jackson stepped down in four or eight years. 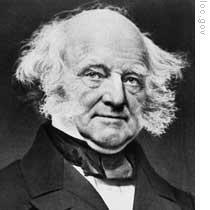 Martin Van Buren also wanted the presidency. He would do all he could to block Calhoun's ambition. 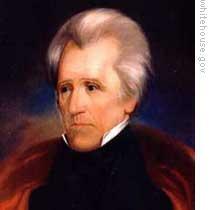 Andrew Jackson was sworn-in as president on March fourth, eighteen-twenty-nine. President John Quincy Adams did not go to the ceremony at the Capitol building. Jackson had said publicly he would not go near Adams. And he did not make the traditional visit to the White House while Adams was there. Jackson was still filled with bitterness over the charges made against his wife in the election campaign. He felt Adams was at least partly responsible for the charges. The sky over Washington was cloudy on the fourth of March. But the clouds parted, and the sun shone through, as Jackson began the ride to the Capitol building. His cheering supporters saw this as a good sign. So many people crowded around the Capitol that Jackson had to climb a wall and enter from the back. He walked through the building and into the open area at the front where the ceremony would be held. The ceremony itself was simple. Jackson made a speech that few in the crowd were able to hear. Then Chief Justice John Marshall swore-in the new president. In the crowd was a newspaperman from Kentucky, Amos Kendall. "It is a proud day for the people," wrote Kendall. "General Jackson is their own president." Everyone tried to get in at once. Clothing was torn. Glasses and dishes were broken. Chairs and tables were damaged. Never had there been a party like this at the White House. Jackson stayed for a while. But the crush of people tired him, and he was able to leave. He spent the rest of the day in his hotel room in Alexandria. The guests at the White House finally left after drinks were put on the table outside the building. Many of the people left through windows, because the doors were so crowded. Jackson was now the president of the people. And it seemed that everybody was in Washington looking for a government job. Everywhere Jackson turned, he met people who asked him for a job. They urged him to throw out those government workers who supported Adams in the election. They demanded that these jobs be given to Jackson supporters. Listen next week for more about Andrew Jackson. Our program was written by Frank Beardsley. The narrators were Jack Weitzel and Stuart Spencer. 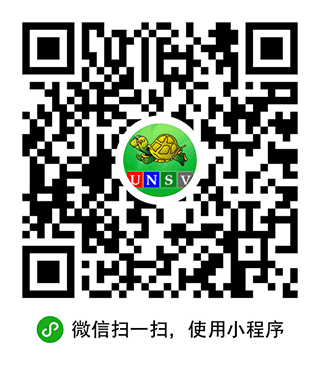 Transcripts, MP3s and podcasts of our programs, along with historical images, are online at www.unsv.com. Join us each week for THE MAKING OF A NATION – an American history series in VOA Special English. Maybe Andre Jackson's fate was most bitter one in the Presidents of the United States. being a President maybe is one's summit at one's lifetime as well as a first lady, Rachel Donelson Jackson. but she had died before her husband, who she had loved whole-heartedly, went to Washington for swearing in as President. it was really a tragedy.